But I am also at a point in my current research project that I want to make more public. While I was still teaching at a college outside Orlando, I developed a course called “Disney’s Victorians,” in which we read a bunch of Victorian texts that Disney has adapted, like Alice’s Adventures in Wonderland, Treasure Island, and Oliver Twist. With Walt Disney World down the street, I thought it might appeal to students, giving them an entry point into Victorian literature. That summer I attended an NEH seminar in California, and since we had some time set aside for research I drove down to Burbank to visit the Walt Disney Company Archives. I thought maybe I”d find one or two things to use in the class. I found so much more than that. The archives contain a fascinating record not just of Disney’s films but of the research behind them. Research reports dating back to the 1930s include surveys of competing adaptations, which I would expect, but also scholarly and biographical contexts that might inform the animators’ work — something that surprised me! Two days in the archives resulted in an article about Disney’s Charles Dickens adaptation Oliver & Company in the Children’s Literature Association Quarterly, and that barely scratched the surface of what I found. The rest of that research will be included in my next book, tentatively titled Disney’s Victorians: Literary History in the Age of Corporate Media. I connect a historical period to a global media company to address a range of topics in literary studies, including form, history, authorship, empire, gender and sexuality, adaptation theory, and institutional processes. 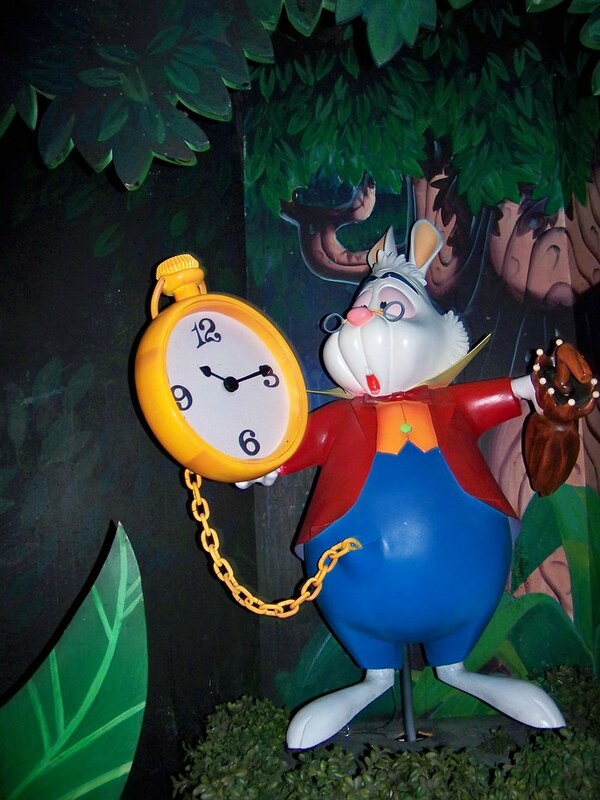 Over the coming months I will share parts of my book-in-progress on this blog: starting today, June 14th, 2018, which happens to be the 60th birthday of the Alice in Wonderland dark ride at Disneyland. When the ride opened in 1958, Disneyland was still in its infancy. Considered the first amusement park to make storytelling its central focus, the Anaheim theme park opened in 1955. Disney’s cartoon musical Alice in Wonderland (1951) featured prominently in the lead-up to the theme park’s opening, especially on the television program Disneyland. The film also inspired the spinning tea cups at the Mad Tea Party, which was among the park’s first attractions. The 1951 film is the one you know. In the last sixty years it has become probably the most recognizable version of Alice, displacing even Lewis Carroll’s books and John Tenniel’s illustrations. The movie was the culmination of decades of attempted adaptations and false starts. The 1923 short film “Alice’s Wonderland” was among Walt Disney’s first cartoons. It was inspired by Carroll’s book, though it uses only the basic idea of a girl in a fantasy world to justify the gimmick of a live-action girl interacting with cartoon characters. Disney brought the film with him when he moved to Los Angeles, and used it as his demo. He found a distributor and created a series of Alice films, which he eventually leveraged into a second series, Oswald the Lucky Rabbit, and eventually Mickey Mouse. Mary Pickford, who at one point was slated to play Alice in a Walt Disney feature. The Disney Company, this story reveals, starts with a Victorian text. And the connection to Alice didn’t stop there. The company had some version Alice in Wonderland in production from the 1920s through 1951. In the book, I use archival materials and press releases to reconstruct what Simone Murray has called “phantom adaptations,” versions of a film that reached some stage of production but were never completed. These phantom adaptations include a version starring Mary Pickford as a live-action Alice interacting with animated characters; dozens of pages of suggestions about how to adapt specific characters, choose voice actors, and fit the studio’s own Alice among existing adaptations; and a script written by Aldous Huxley, complete with a frame narrative in which Lewis Carroll and Alice meet the actress Ellen Terry. Each of these adaptations struggles with a question of form. While the Alice books offer rich material for the cartoon, whose key formal feature is the “gag,” animators continually struggled to connect those episodic moments into a single, unified story with compelling characters. In the book I discuss how the various phantom adaptations approached this struggle.